With a population of just 500,000, the Cape Verde Islands will become the smallest country ever to compete at the Africa Cup of Nations finals. As you may know, Cape Verde have esteemed alma mater – Man Utd winger Nani and Porto defender Rolando, who both represent Portugal, are Cape Verdean, while former Sweden striker Henrik Larsson’s father also hailed from the island nation. Coach Lucio Antunes, an air traffic controller by day, has overseen the first landing of a Cape Verdean flight at African football’s summit. In April 2000, the Blue Sharks were ranked 182nd in the world but the upward trajectory was ignited that same year when they beat Mauritania 2-0 at home to record their first win a competitive international fixture. 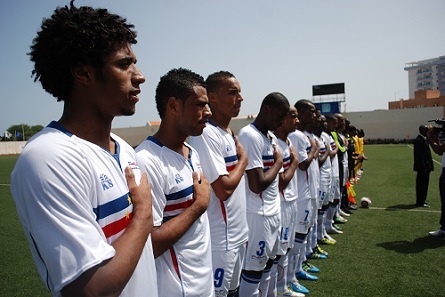 Since then, through tapping into the Cape Verde diaspora, particularly in Portugal, Cape Verde’s football ability has emphatically exceeded the country’s vast numerical disadvantage. They’re now ranked 51st in the world. Their ascent to African football’s top table hasn’t been plain sailing; there have been the body-blows and throw-in-the-towel knock outs that make or break teams. Qualification for the 2012 Cup of Nations ended not just in heartbreak, but double heartbreak. Firstly, a worse head-to-head goal difference against Mali meant Seydou’s slickers piped them to top spot in their qualifying group (particularly heartbreaking as Cape Verde were in top position with three games to go, but then lost two of those games), and secondly, their quest to earn automatic qualification as one of the two best second-place teams was rebuffed as they finished behind Sudan by mere goal difference. Given the composition of their squad – nine are based in Portugal, the rest are dotted around France, Cyprus, Luxembourg, Romania, Angola, with only one based in Cape Verde – it could have been easy for it to all disintegrate in the era of international football cynicism, but Antunes has formed a consistent, cohesive unit. Their biggest strength, then, may just be their surprise factor, theoretically and footballistically. Not only is their team as a whole relatively unknown, but many of their players, even the more illustrious ones, are lowkey. Lille’s Ryan Mendes is unquestionably the illustrious name for French football aficionados, but the rest of the players have had relatively little time in the spotlight. As Cameroon found out in the qualifiers, teams will be facing a legitimate threat they have little knowledge of. Given the majority of the team play at a good level of European football, they are certainly a threat worth knowing about. Their surprise factor is further elongated by their counter-attacking stratagem. Like their colonial masters Portugal, they are well endowed down the wings, possessing pace and trickery. With their traditional 4-5-1 underdog formation, the traffic may be one-way but the Cape Verdeans ability to lull the commuters into their embrace before biting through them with utter vitriol shouldn’t be underestimated, as the (In)domitable Lions of Cameroon will attest. Apt for a side coached by an air traffic controller, the deliveries from set-pieces are Stokeingly good – they’ll arguably be the most dangerous team at the Africa Cup of Nations from dead balls. ITV and Eurosport complaints may go into overdrive as goalkeeper Fock’s name is uttered, especially if he makes the customary error, but they’ll be spared as Vozinha is the number one. The back four are fairly easy to predict – the combative veteran captain Nando and Fernando Varela are the centre-back pairing, Carlitos, a cousin of Nani, is the right-back and Nivaldo is the left back. The composition of the midfield is up in the air as Stade Reims’ Odair Fortes mystifyingly pulled out of the tournament. The small Toni Varela will most likely take his place on the right wing, whilst the experienced Ronny and Marco Soares provide the midfield steel, and Babanco or David Silva will probably play on the other wing. ‘They are all efficient but unspectacular players, leaving the fireworks to those ahead of them. 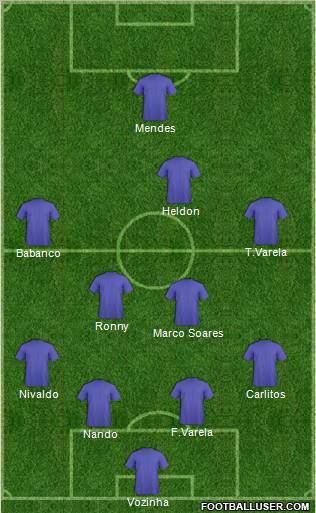 Indeed, Ryan Mendes and Heldon, who plays as the attacking midfielder, will be the key ahead of them and are particularly opportunistic when on the break. The robust Djaniny is another notable option Antunes has at his disposal. He is a target man and was favoured over Mendes in the away leg versus Cameroon. The Blue Sharks are the team most capable of progressing to the knockout stage out of those expected to be the whipping boys (Ethiopia, Niger, Togo); unlike Ethiopia, they seem peripatetic enough not to be overawed; unlike Niger, they have far more incision to cause the bigger teams problems and are more used to the big occasion; and unlike Togo, their preparations have not been besieged by squad unrest. More significantly, though, they are in the most open group compared to the aforementioned trio. The opening game against the hosts will be a tough one but not insurmountable given South Africa’s lack of conviction in attack, the enigma of Morocco is beatable, and they could thrive in the acres of space Angola leave behind when they go forward. Previously an assistant to former coach Joao de Deus, the 46-year-old is on long leave from his day job as an air traffic controller to coach. In 2009, he coached the U-21 side to a gold medal in the Lusophone Games in Portugal. He spent a week last December shadowing Real Madrid manager Jose Mourinho. If Heldon was Tanzanian, it’d be particularly apt as they’d evolve his nickname to ‘Nhucksy’/’Nuksi’, which means ‘misfortune’ in Swahili. The attacking midfielder has heaped misfortune on myriad countries, finishing Cape Verde’s top scorer during the 2012 Cup of Nations qualifying. He scored the crucial away goal in Yaounde, a fantastic free-kick that all but ended Cameroon’s hopes. The Lille player is the most exceptional talent that Cape Verde possess and provides the spark in attack with his pace and dribbling ability. 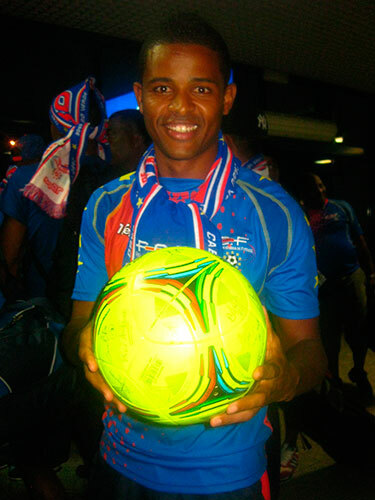 Mendes has only played 9 times for the Cape Verde Islands, but has three goals to his name, all scored during the side’s remarkable qualification for the tournament. Quite informative. Looking forward to seeing them play. Thanks. Really think they could surprise a few people, their coach says they’re just happy to be there but I think they have enough spark to shock some teams. I stated Heldon was the top scorer for 2012 Cup of Nations qualifying NOT 2013 – 2012 was Heldon, 2013 was Mendes.